Heat the oil in a heavy pot and set over medium high heat. When hot, put in the onion. Cook until the onion are sticky and light brown in color. Then add the cumin, coriander, aniseed, chili, galangal, lemongrass, and turmeric. Cook briefly until they are fragrant. Add the coconut milk and bring the curry sauce to a boil. Turn the heat to low and simmer for 10 to 15 minutes. Then, add the chicken wings and sea salt. Stir and bring it to a boil, and remove from the heat. Place the chicken on a large baking tray together with all the sauce, in a single layer. Bake the chicken for about 18 to 20 minutes on each side. 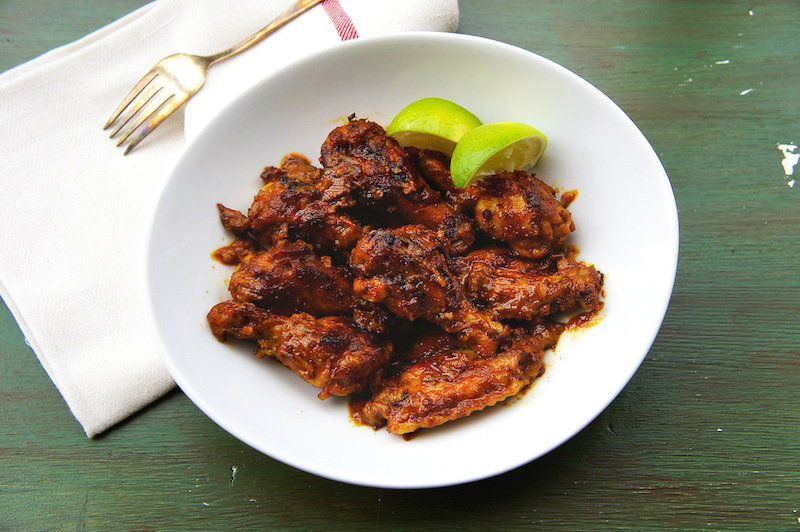 Serve the chicken wings warm with some lime wedges. I am one of the least likely candidates to make anyone else's recipe. I'm very independent that way. But this is too good to overlook. And guess who has chicken wings in the freezer? Might sound slightly dumb, but how do you get lemongrass powder? Can you substitute with smashed lemongrass? The lemongrass powder is available at Asian grocers. You can use fresh lemongrass, make sure to it's finely chopped. I've never seen coconut milk chicken wings. They look AMAZING!